All trip prices include your ride upriver, the boat rental, paddles, life jackets and a map upon request. Prices are the same per person whether you decide to canoe, kayak or raft. Please note that we do not provide fishing tackle, bait or rods, so if you intend to fish, you should plan to bring your own gear. Want a boat to go for the day (no shuttle)? We rent canoes for $60 per day – due back by 5pm. We have 16′ Old Town Campers. They are a great lightweight canoe for river trips and track well. Each boat has two molded seats and comfortable carrying handles. These canoes will seat (2) people. 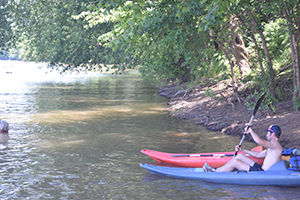 We have 11.5′ single person sit on top style kayaks. They are great all purpose kayaks, track well in flat or rapid filled water and are great for beginners. The high seat back is great for extra support on full day trips and each has a storage area for a 14 quart cooler. Our rafts are rugged for rapids but are just as effective in low or flat water. They are fast with a raised floor that allows them to skim across the water like a bug. Rafts are lightweight enough for two people to carry. Rafts carry (4) or (6) people. 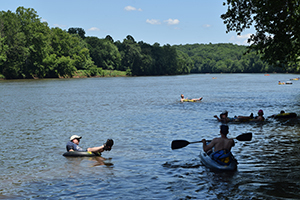 *We do not match groups for rafts to meet the minimum person requirement; if you only have 2 or 3 people in your party, we recommend a combination of canoes and kayaks. All trips listed take off from our Headquarters and you will be carried upriver to float back to Scottsville unless otherwise indicated. The driver will go through all trip details, a safety briefing and general paddling instruction upon request at the drop point. These trips are for canoes, kayaks, and/or rafts. Tubing is only permitted on the beginner 4 mile trip. All equipment is due back by 5pm. *Please note that the duration of each trip is an estimated paddle time based on current river conditions. This is a scenic introductory run over calm water that begins at the historic Hatton Ferry (the only pole operated ferry left in the United States). Great for beginners learning how to paddle and/or people with a tight schedule that want to only spend a couple of hours on the water. It is also the most flexible for arrival times. This is our most popular day trip starting at the old Warren ferry location. It consists of mostly calm riffle-filled water with (1) set of Class I rapids. There are plenty of islands and sandbars on which to stop and enjoy your riverside picnic and it is a great step up from the beginner run if you’re looking for more excitement. 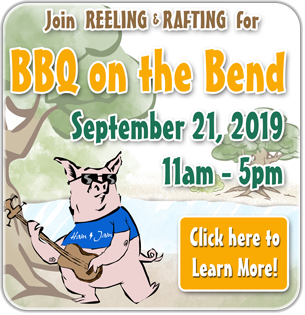 Bring your own tackle and gear for full day of fishing and floating on the James. This trip departs our HQ bright and early at 8am. It starts at the mouth of the Rockfish river and includes a couple of challenging Class I – II rapids. Besides the two sets of rapids, the river is mostly clam and this section offers some great fishing. There are lots of islands and sandbars for you to pull onto for some wade fishing and/or picnicking. *This trip is geared toward experienced river enthusiasts that have some paddling experience in Class I & II rapids. 2 boat minimum This is our most remote river trip, so we require you to have a buddy boat. This trip starts from our HQ in Scottsville and goes downriver to Bremo Bluff. 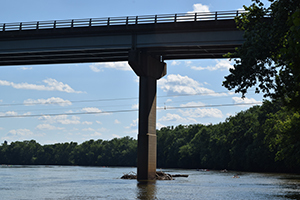 It is geared toward experienced paddlers only. 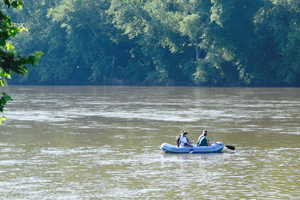 A full day on the James with riffles, ledges and Class I rapids offering some of the best fishing on the James. There are a few Class II rapids to make it a challenge for the experienced paddler. This is our most popular fishing float for those who want to bring their gear and enjoy the most remote option that we offer. Pick up time at Bremo Bluff is 3pm.